Surely we have all seen, or perhaps experienced the joy of eating a hot dog wrapped in bacon from a streetside vendor. They broil to perfection in their casing of bacon, and are topped with onions, mayo, mustard, onions, green peppers and ketchup – and of course a nice grilled chili. A Los Angeles classic. The population of the street vendors grows as you head east. I have found what I believe to be the biggest concentration in downtown Los Angeles, in the Fashion district. Many people also are familiar with them after a night out in Hollywood, where they are also abundant. They have even shown up at anti-war rallies. Despite all that, I think that they are here to stay. And for that I am glad. Oh. My. Gawd! That is the best food photograph ever! I’ve always called them road kill hotdogs. I always hear them called “ghetto dogs”. One of the things I like most about living downtown is that these greasy monsters are only a half a block away at any moment, unlike when I lived in Hollywood and they only seemed available immediately post-bar. OMG those are sooo bad for you yet soo good at the same time lol. My friend can never pass one up every time we leave a club late at night. I eventually give in too! One of the worst exports from Mexico… ever. Well, I’m not sure Mexicans are the ones who brought bacon-wrapped hot dogs to LA, but I know many Mexicans who like them like that. i wish they had them near my work on days other than friday, i’d go get one right now. Illegal dogs taste best. Its a proven fact. As far as legal dogs go, Skooby’s on Hollywood has some delicious choices. The almost orgasmic deliciousness of a bacon-wrapped hotdog can only be heightened by the implied danger of eating something that comes from an unlicensed cart on a filthy street while a transient sits three feet away asking for a quarter. Man, I love this town. 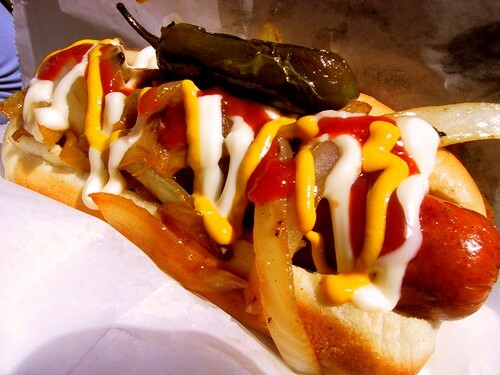 danger dogs, danger dogs, doing the things only danger dogs can, if you eat them you’ll be fat, danger dogs. or as i like to call them, los perros peligrosos. Eh, we usually call them cancer dogs, not danger dogs. i was just walking from wilshire/hope to 1st/vignes and noticed the proliferation of these hot dog stands EVERYWHERE. ive never tasted one, but the aroma alone always tempts me. thank god the aroma of the panhandler next to the stand decreases my appetite ten fold.